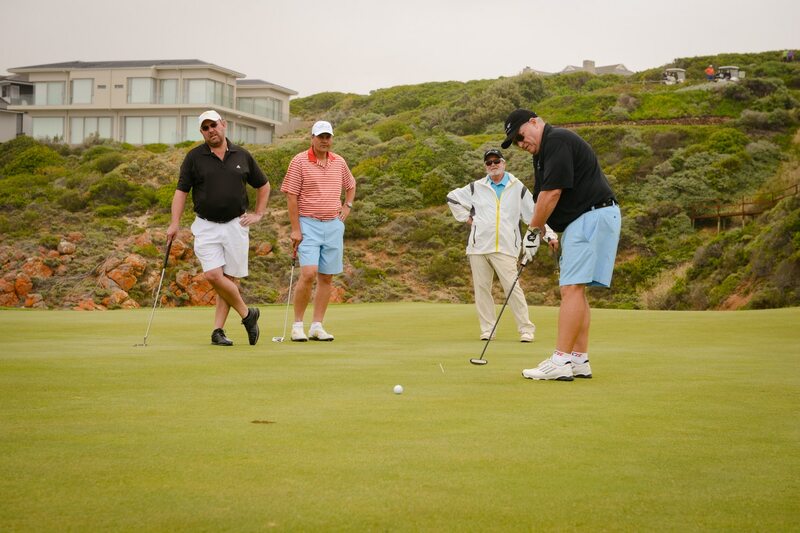 The 1st hole on the Pinnacle Point is a gentle introduction to the first nine, also known as the Oyster Nine. This dogleg left plays a little uphill to a kidney-shaped green. The hole has a generously wide fairway and a green surrounded by an amphitheatre of embankment. 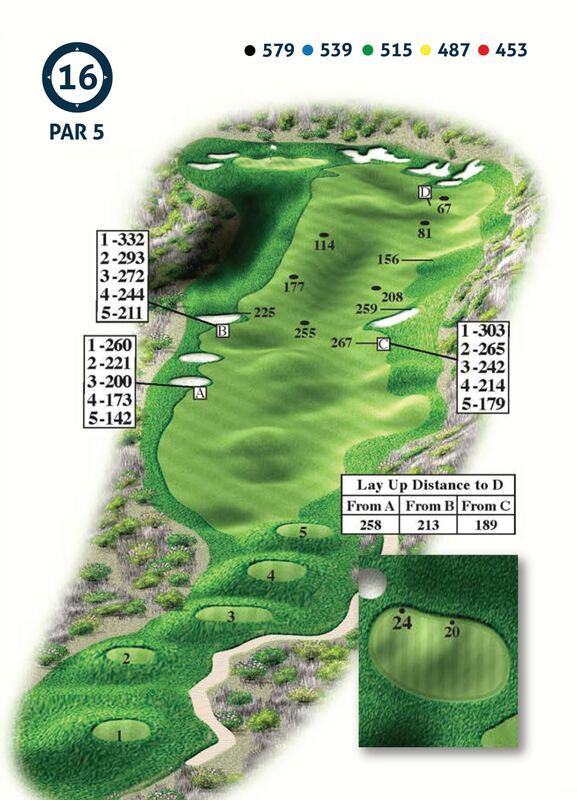 Tip – The first hole is a generous par 4 with a dogleg left. A drive towards the two fairway bunkers on the right will leave you with an open approach to the raised green. 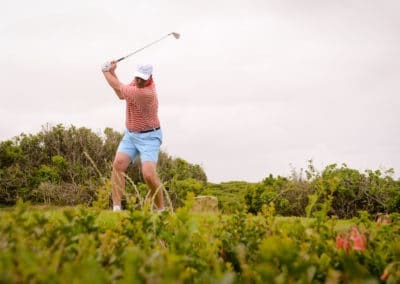 The longer hitters can play left of the fairway bunkers, however cutting too much off the dogleg will leave you in the fynbos. 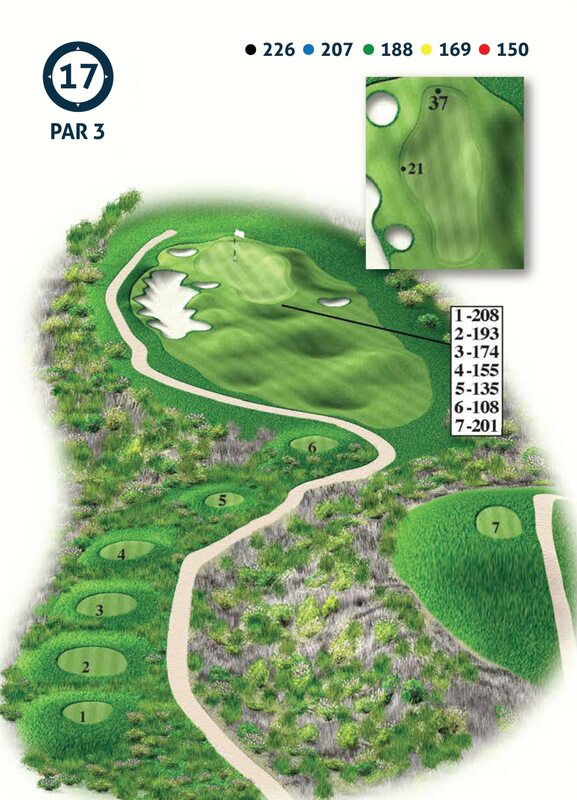 The short 2nd hole climbs a little to a raised green that would be considered a blind green by most golfers. The contours of the fairway create a valley down the middle of the hole. Two bunkers halfway up the fairway frame the hole perfectly. 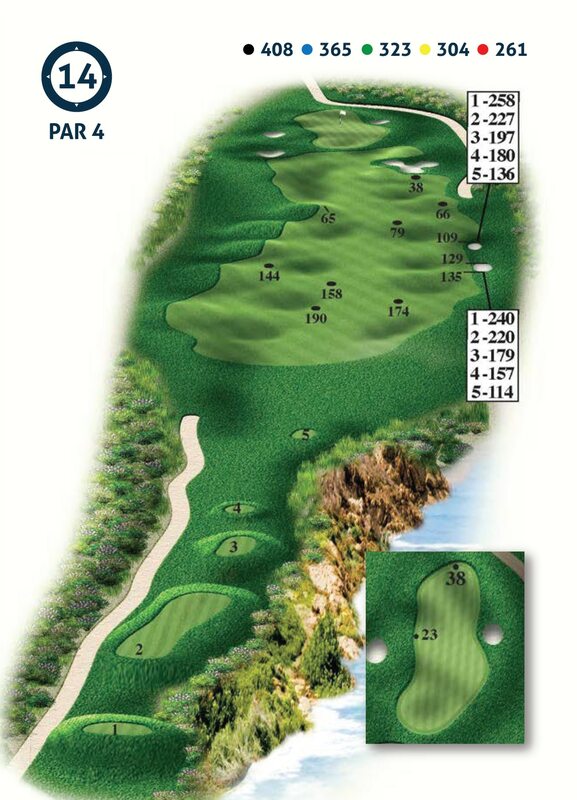 Tip – This straight forward par 4 plays uphill to a slightly blind green. Use the pole behind the green as a line for your approach to the centre of the green. This green slopes down grain from back to front, so remember to putt a little firmer up the slope, and a little softer down the slope. The 3rd hole doglegs slightly to the left. The driving area is split in two, with a strip of semi-rough sandwiched between two levels of fairway. The 11 pot bunkers on the approach to the green help to create the hazard on this hole. 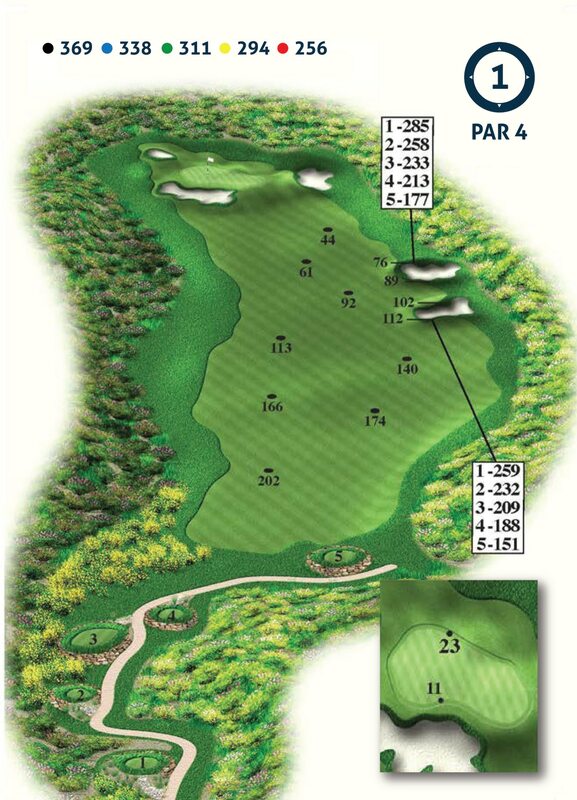 Tip – Your drive is key on this par 5. There are acres of space on the right and even a pushed drive can bounce back down into the middle of the fairway. Stay out of the 11 pot bunkers that line either side of the fairway. The approach to the blind 3rd green is through the valley in the fairway. 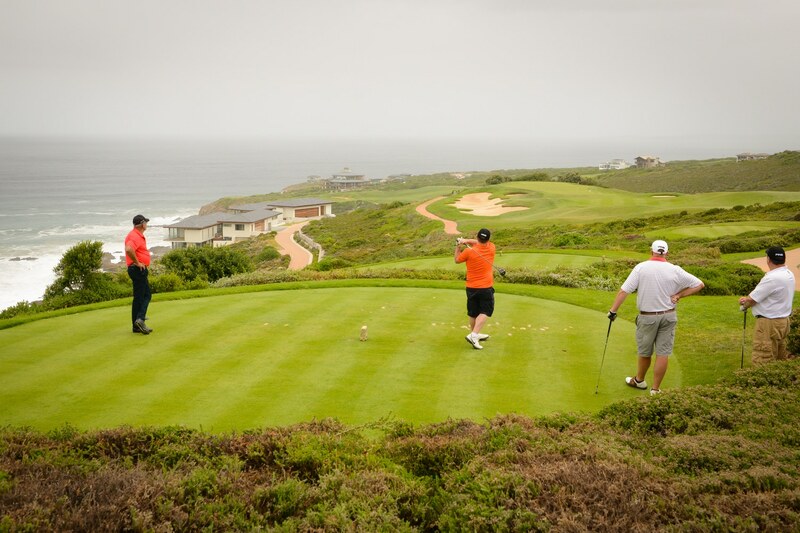 The 4th hole is a fairway etched out of a sea of fynbos on the highest part of the golf course. This hole is the toughest hole on the course because it’s long, intimidating and demands good shots. It’s also the start of the journey back towards the ocean. 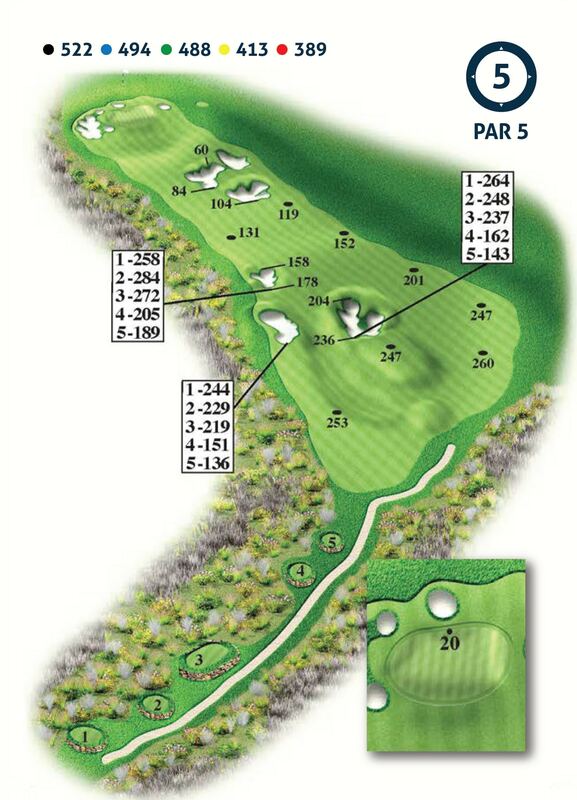 Tip – This is hole 4, stroke 1. It looks tough, and it is. Take the club the will land you in the fairway. 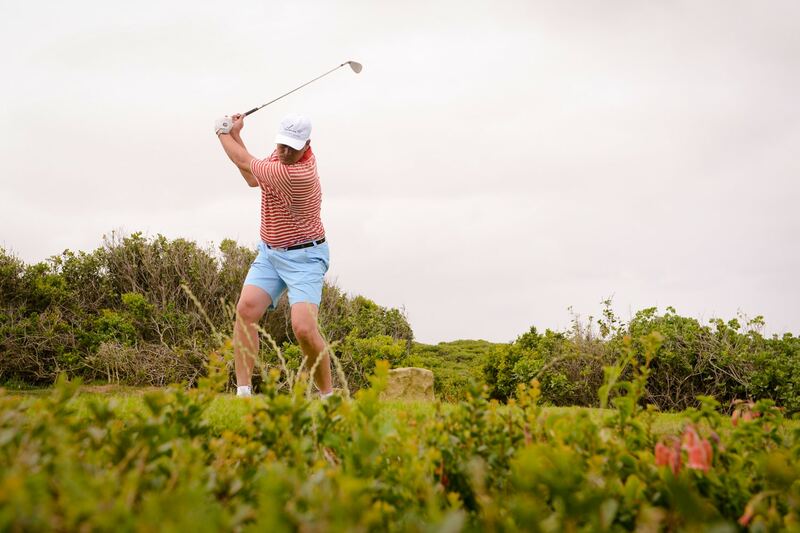 A ball hit left or right into the fynbos will probably never be seen again. Letting the ball bounce and roll onto the green is always a good shot option. 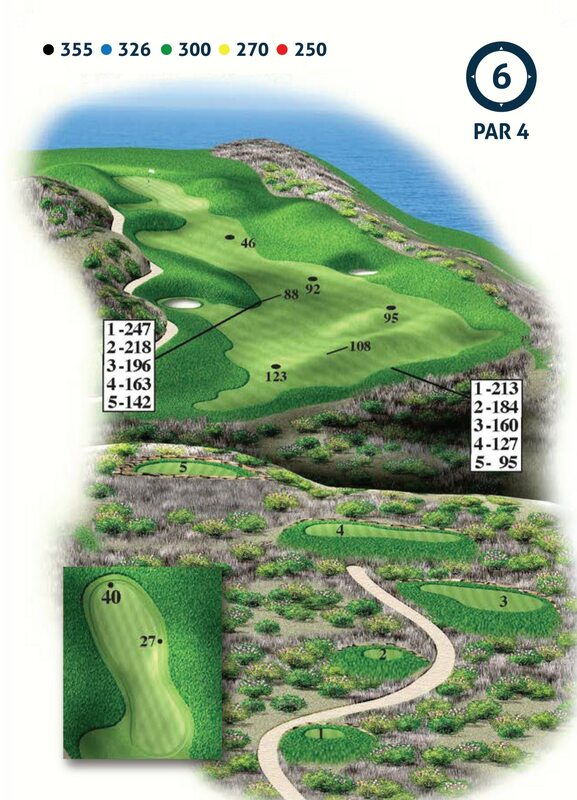 The 5th hole is a par 5 that flows down towards the ocean. The features of this hole are the two large fairway bunkers that create an illusion, hiding the actual the depth of the fairway. The blind drive is followed by a downhill approach to over a cluster of well-placed bunkers. 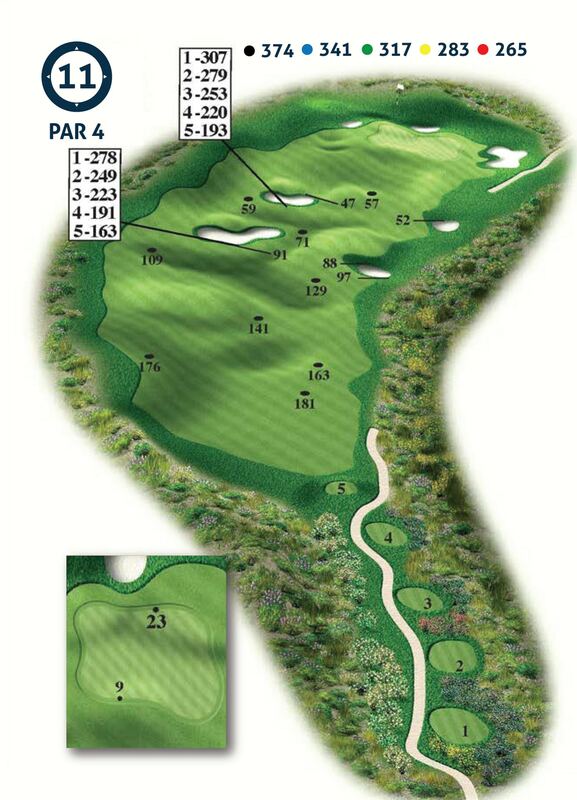 Tip – The 2nd par 5 on the course is also the easiest hole on the first nine. The ideal drive is to the right fairway for the shorter hitters, to the big right bunker for the medium hitter and over the big left bunker for the longer hitter. 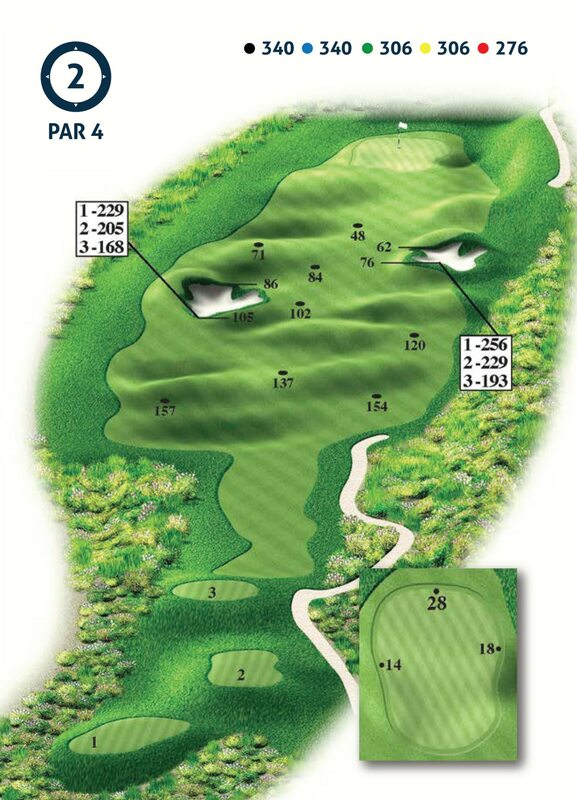 It’s a good idea to check your course guide or hole map to see how the hole actually plays. The 6th hole has a classic old Irish Links feel (it definitely shows Darren Clarke’s influence on the design). 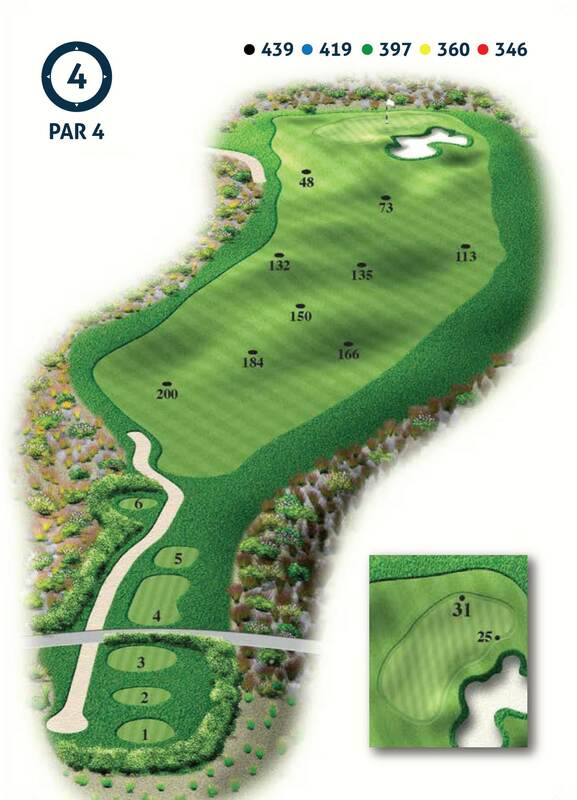 The signature of the short par 4 hole is the large mounds that flank the green on either side. Tip – This “links type” hole is more about positioning your shots, rather than muscling long shots to get to the green. The hole requires a drive to the right centre of the fairway and an accurate approach to the long, thin green flanked with large mounds. Don’t “bank” on getting a favourable bounce off the mounds…excuse the pun. 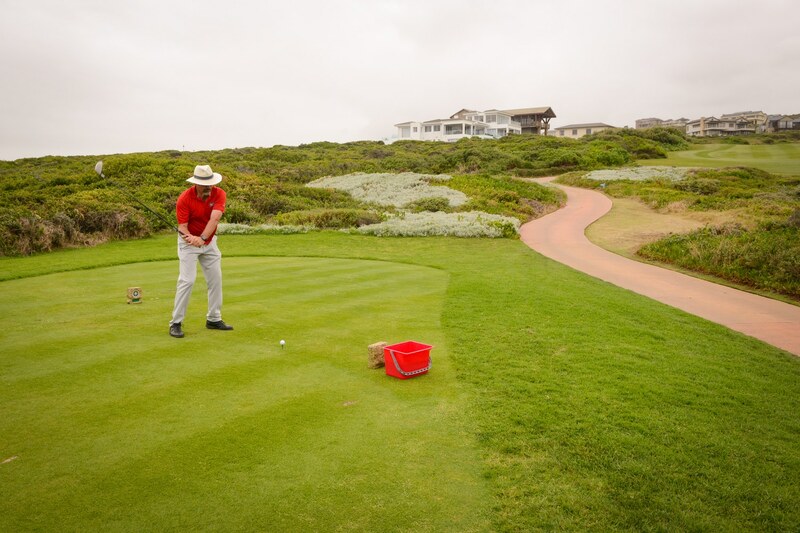 Most golfers agree that Par 3 Hole 7 at Pinnacle Point is one of their all-time favourite holes. The dramatic scene looking down from the tees to this island green perched on top of a cliff is awe-inspiring. In winter the Southern Right Whales are regularly seen below this green. Tip – This short par 3 always plays a little shorter than the distance indicates, due to the downhill approach – work on about 10%. Check the wind direction. It helps to ride the wind on this hole. 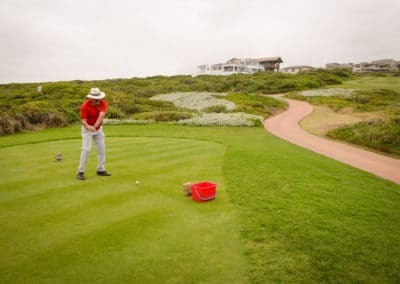 The 8th hole is a “Risk and Reward” hole that offers a safe option up the left fairway, or a brave option across more than 200 metres of ocean to a green surrounded by numerous pot bunkers. This hole is a guaranteed talking point after the game. Tip – This is a true “Risk and Reward” hole. There are only 3 reasons why you shouldn’t give this par 4 a go at driving the green. 1. If you can carry the ball further than 200m through the air, 2. If there is any wind into your face, 3. If you don’t have an ego. The option to play the hole as a dogleg will leave you with a mid to short iron approach. 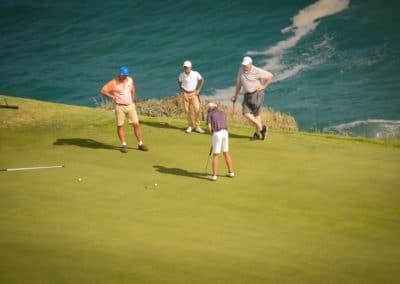 The par 3 9th green is perched on top of a 40 metre sheer ocean cliff. 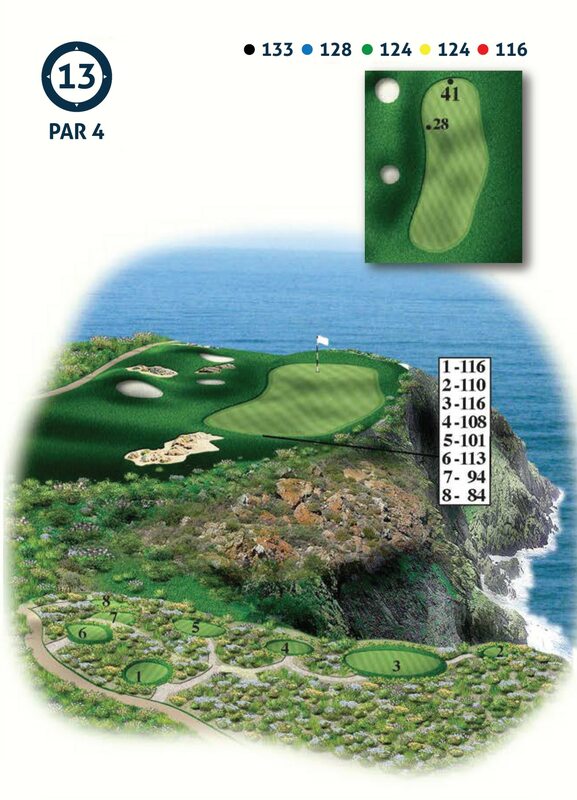 The direct line to the pin from the professional tees is across 185 metres of ocean and rock. This hole is not for the timid, and is the second most challenging hole on the front nine. Tip – The “bail-out” option on this hole is to hit the ball left of the green. The brave option is to hit the ball straight at the pin. 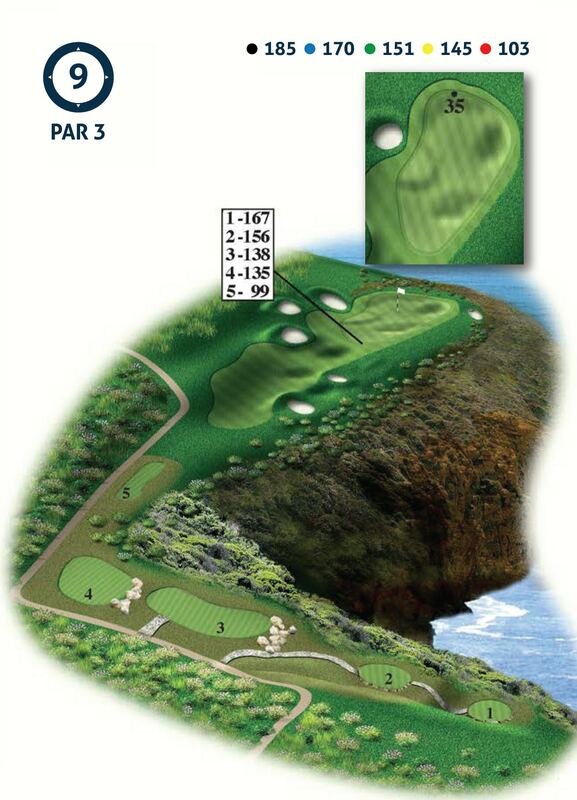 The careless option is to bring the ball over the cliffs and onto the green from the right. The ball feeds from left to right on this green. The good players always use the left to right slope on this hole. As with the 1st hole, the 10th hole is a gentle introduction to the back nine or Eden Nine. Look back from the 10th green and you realise how much this hole plays uphill – notice the height of the clubhouse. The green is well raised and is just less than 40 metres in length. Tip – Try to use the wide left side for your drive. The right fairway bunkers are reachable for the longer hitter, however the left bunker is only a sighter bunker and is the preferable line for the drive. Always take an extra club on the approach. The hole plays more uphill than you think. The 11th hole is a swooping dogleg right down into a shallow valley and up onto a double-tiered green. The fairway bunkers provide the golfer with many options on how to thread their drive down this hole. The slopes on this green leave many golfers scratching their heads in disbelief. Tip – Line your drive up to the first fairway bunker on the left. Longer hitters should leave their drivers in the bag on this hole and go with a rescue or fairway wood. The ideal landing area is on the left side of the fairway, which will normally feeds onto a flatter plateau. Watch out for the green. It’s down grain, down hill thriller with a double-tier. The 12th hole is a jaw dropper. 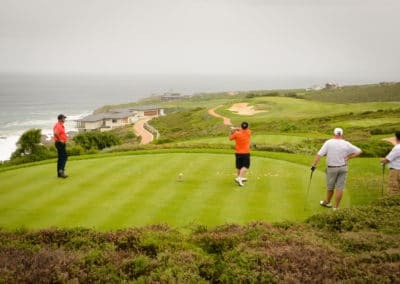 The tees are wedged into the side of a hill that looks down over the beauty of Eden Bay and an equally magnificent golf hole. The feature of this hole is the white bunker sand that divides the fairway from the ocean cliffs. The view from this green, with the clubhouse across the bay, deserves a second look. Tip – The two pot bunkers on the left slope are sighter bunkers. Any shot at these bunkers, or even slightly to the right of them will result in a great tee shot. Take note that there are Out of Boards markers to the left of the cart path. The green, like the fairway, slopes a little left to right. 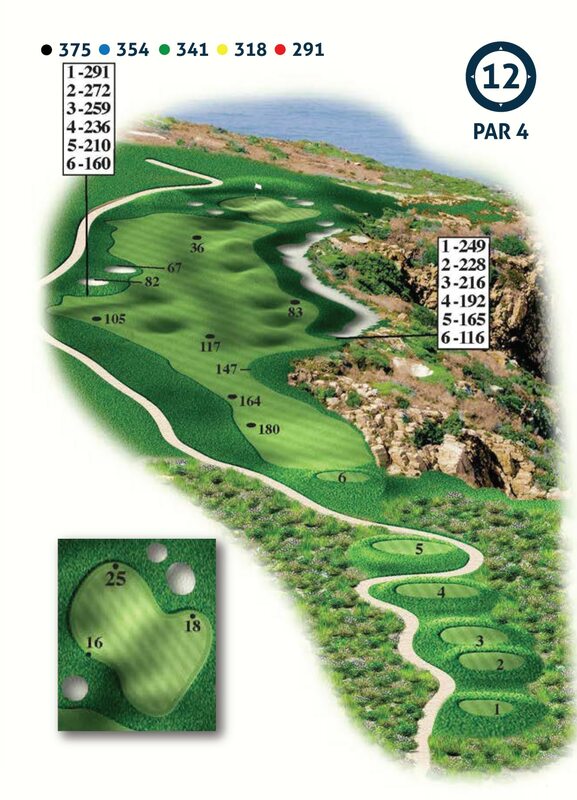 The 13th hole is the signature hole at Pinnacle Point. The ocean and dramatic sheer cliffs separate the green from the eight different tees. A memorable feature on this hole is the waste bunkers with large rocks protruding. Most golfers need to play this hole a few times before the intimidation wears off. 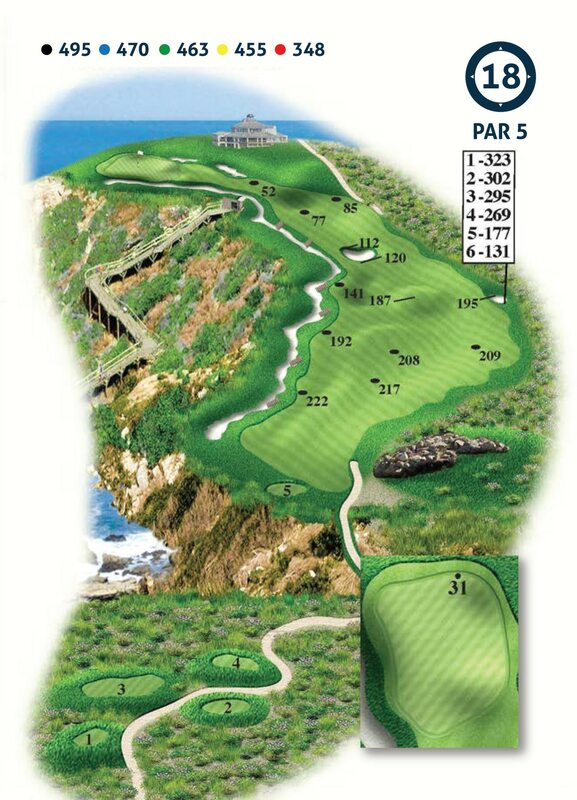 Tip – This spectacular par 3 requires a medium length approach to a double-tiered green over an ocean chasm. The two-tier green slopes towards the front left portion of the green. Trust the distance on the cart or tee marker, not on what it looks like. This is a great traditional par 4 that demands a good tee shot. The hole slopes from right to left and provides a perfect platform for shot making. 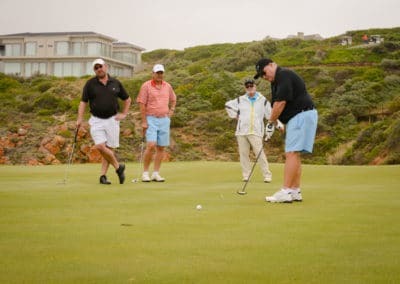 This hole has a mature feel and is framed with colourful fynbos and a panoramic view of the ocean. Tip – The preferred line of drive is up the left half of the fairway, which results in the ball feeding to the middle or right of the fairway. 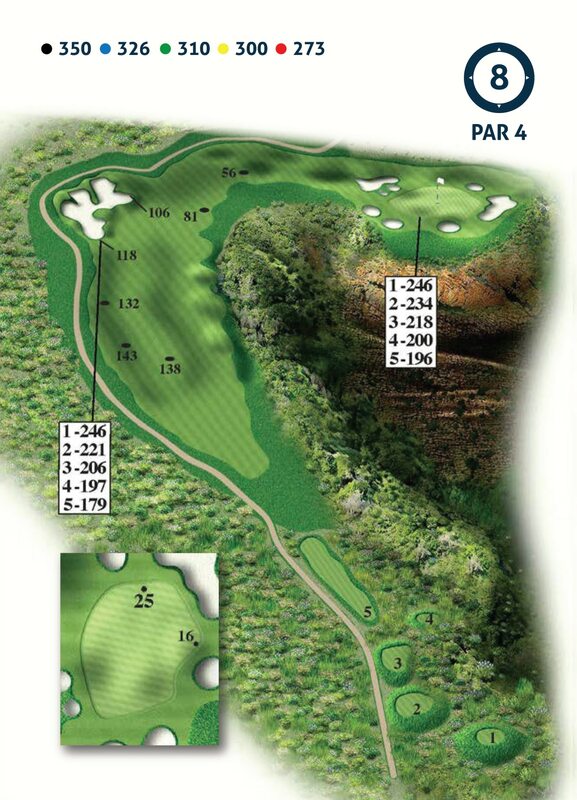 The slightly raised green is 38 metres in length, so check the pin placement for an accurate approach shot. 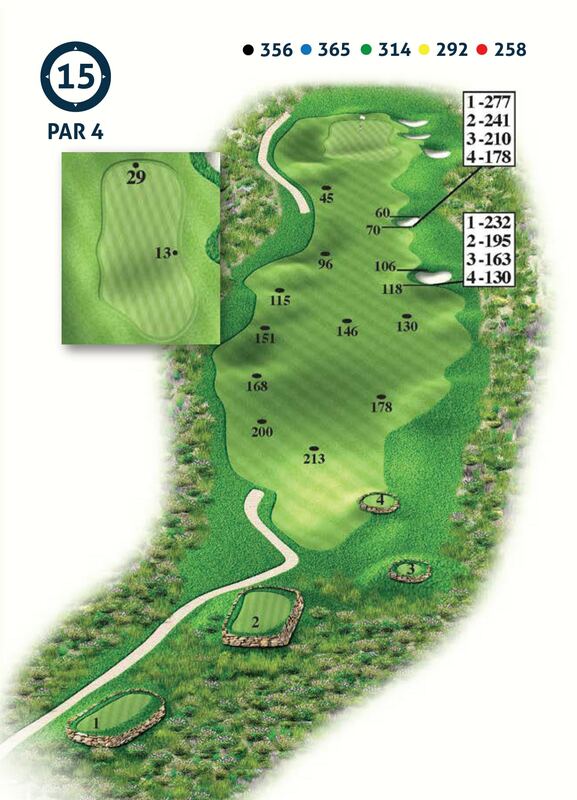 The 15th hole is a narrow par 4 that punishes the poor shot. 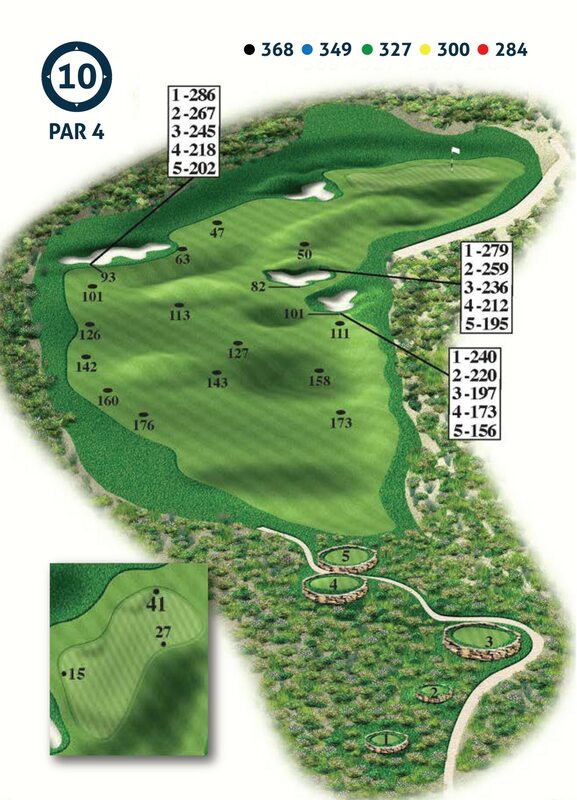 The golfer uses the large pot bunker on the right of the fairway to line up the fairly blind drive. The green is divided into a front level, a lower middle level and a higher back level. Tip – The hole is not long, but the fairway does narrow the closer you get to the green. The large pot bunker on the right is a good line for the shorter hitter, and just left of the bunker is the line for the longer hitter. The green flows a little from right to left across three different levels. 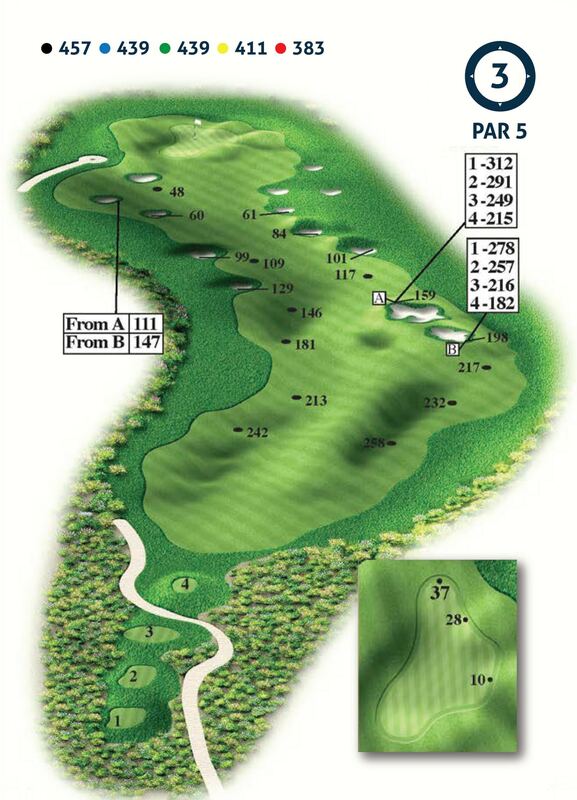 The 16th hole is the “Burma Road” of par 5’s. 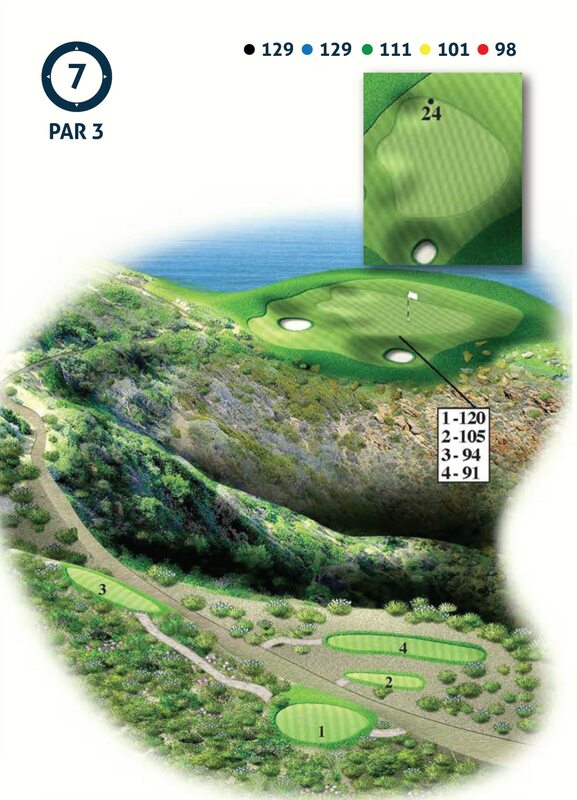 It measures 580 metres from the back tees and is a three shot par 5 from any tee. Golfers are urged to skirt past the large depression that catches any ball that lands on the left half of the approach to the green. An amphitheatre of embankment sets the green beautifully. Tip – The 16th hole deserves it’s stroke of 2. The driving area is fairly obvious, however the 2nd shot must be played well to the right. The far right fairway bunkers short of the green are your target line. This hole takes at least 3 shots to reach it. Respect that fact and you will score well on this hole. The 17th hole is a long par 3 with a long green, a long bunker on the left and an even longer flank of fynbos down the right. From the slightly raised tees the golfers look down to the green that doglegs a little to the left. The 17th green is also the only par 3 green that isn’t perched on an ocean cliff. Tip – If you get a stroke on the hole, use it. Don’t be greedy and try to fly the ball all the way to the pin. A slight “lay up” on this tough par 3 is often a good play. The green slopes gently uphill from the front to the back. 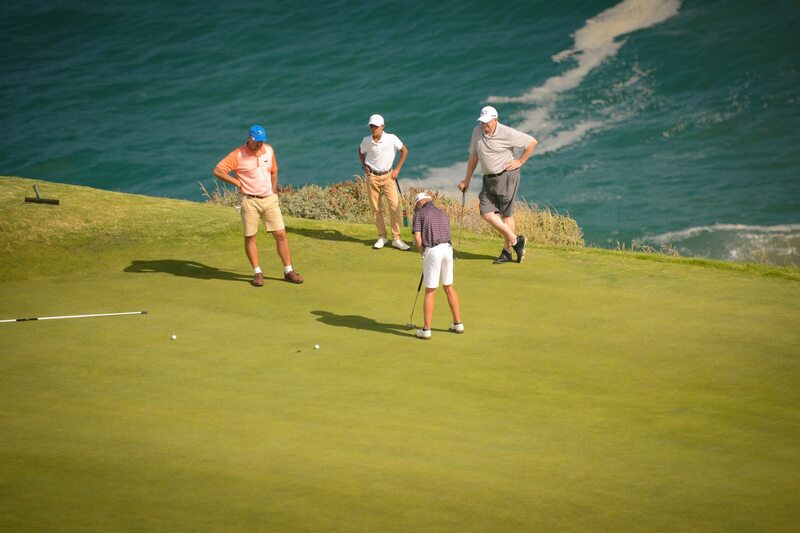 The 18th at Pinnacle Point is finishing hole that’s difficult to forget. The hole plays along the cliffs of Eden Bay. The features of this hole are the 300 metres of white bunker sand that line the left of the hole, and the aggressive slopes from right to left all the way down this hole. This hole was designed to offer the golfer options. Tip – The 300m long bunker down the left of the hole is to be avoided at all costs. A drive to the right half of the fairway is crucial. A good drive for the longer hitter leaves you with a few risky options on reaching the green for two. The final approach towards the green is downhill and offers the golfer a good option to roll the ball onto the green.